A lightened-up, whole wheat carrot bread filled with walnuts, raisins, shredded coconut, and a touch of lemon zest. It’s like eating carrot cake for breakfast! Last night, Ben and I signed the lease on a new apartment we will be moving into at the end of this month! We’re excited for a new space that we hope can be home for a few years, but at the same time… moving is SO overwhelming (even when you’re only moving a few minutes away). I’m dreading having to pack up all our things and reorganize them into a different space. BUT, I’ve decided that we are going to seize this opportunity and make the most of it by purging some of our clutter. We literally have a closet of things that we never use. Partly because we can’t remember what’s even in there and partly because anything we do want is too hard to find. This upcoming project reminds me of the home renovation shows I used to love watching on TLC when I was growing up. There was one where they would make the homeowners bring all their belongings out into the yard, and they had to throw like 90% of it away. Usually, there was a good amount of crying, and occasionally even screaming, involved and I think I’m going to need someone to come over and go through this same process with me, lol. Any volunteers? My other goal for this month is to put some of my semi-forgotten pantry items to good use and clean out our kitchen cabinets in preparation for the move. Fortunately, this is a goal I’m more excited about. It means getting creative with my meal planning and most likely, embarking on some new cooking & baking projects! 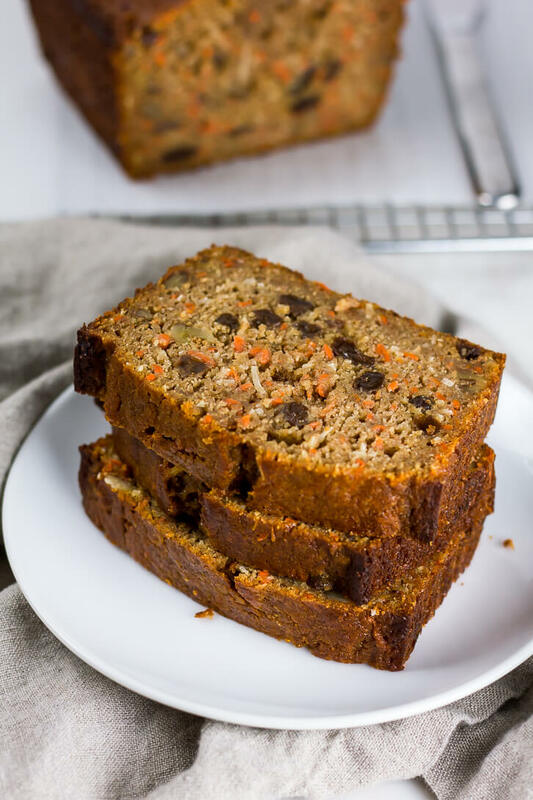 So today, I thought I’d share with you my whole wheat carrot bread, which is one of my favorite clean-out-your-pantry recipes. I bake a loaf of it whenever I have leftover carrots in the fridge and it comes exactly how I like my carrot cake: with plenty of raisins, coconut, and walnuts in the mix. However, I’ve made this bread without the raisins and/or lemon zest before (in case any of you raisin-haters were wondering), and also with almonds or pecans for the nuts because I didn’t have any walnuts at the time. It’s a forgiving recipe. In addition to using whole wheat flour (and lots of carrots – yay for veggies! ), I made this bread with Greek yogurt and applesauce to lighten it up a little. I also made sure the bread comes out nice and moist, so much so that I enjoy eating it all by itself. It’s perfect for breakfast or a snack and I especially enjoy it when served warm. Like most quick breads, this carrot bread is a pretty simple, straightforward recipe. My one pro tip would be to check out my favorite tool for making carrot cake/bread: an electric grater (aka salad shooter), which makes shredding the carrots an absolute breeze. Grating carrots by hand is such a pain in my opinion, and the texture is just not the same when you shred them in a food processor. So, I love having my salad shooter, which means I can always make carrot bread on a whim, with no fuss! If you make this whole wheat carrot bread, don’t forget to post a photo and tag @flourcoveredapron on Instagram. Seeing your baking creations always makes my day! A lightened-up, whole wheat carrot bread filled with walnuts, raisins, shredded coconut, and a touch of lemon zest. It’s just like eating carrot cake for breakfast! Place the raisins in a bowl of hot water and set aside to soak for about 20 minutes. Meanwhile, preheat the oven to 350 degrees Fahrenheit and prepare a 9.5x5 inch loaf pan by lining it with parchment paper, then greasing it with nonstick cooking spray. In a medium-size bowl, whisk together the dry ingredients (flour, baking powder, baking soda, spices, and salt). Set aside. In a large bowl, whisk together the melted butter, honey, eggs, applesauce, and Greek yogurt. Fold in the carrots. Gradually add the flour mixture, folding to combine after each addition. Drain the raisins, then add the raisins, coconut, walnuts, and lemon zest to the batter. Fold to combine. The batter will be thick. Pour into the prepared loaf pan and bake at 350 degrees Fahrenheit for 55-65 minutes, or until a toothpick inserted into the center comes out clean. Let cool completely on a wire rack.